This Website was last updated:- . For the People of the Parish. Betty Murphy, Rathfeston & Bridgie her sister who died recently. Daniel & Margaret Scally & daughter Geraldine, Ballinagar. Eddie Dolan, Dublin & Cloneygowan. Helen Connors, Chancery Close, Tullamore. James & Mary Hynes, Killaderry. Richard Gahan, St. Oliver’s & his dad John. Noel O’Meara, Ballinagar. 1st Anniv. Annie & Matthew Gonoude, Derrygolan & Deceased Family Members. Readings will be posted out to you. If you cannot come up to receive Holy Communion please raise your hand and the Minister will go to you. Thanks to all for your wonderful support of Trócaire. Please bring your Trócaire boxes to any of the masses. If possible please convert the contents of your box into notes, for consideration of your neighbours who volunteer to count this money. Feeling involved in our parishes. P28. The six C’s for Catholics today. P29. Faith in our schools. P30. JOIN ACCORD as a Marriage Preparation Course Facilitator: The Catholic Marriage Care Service. Contact Aisling on 01-5053112. See poster for more details. www.loughderg.org 2019 Pilgrimage posters & brochures at church entrances. St Sinchills Camogie Club Cake Sale this Easter weekend 20th & 21st from 6.30-10.30pm Sat & 10am-1pm Sun, in the GAA rooms Killeigh, please come and support, lots of goodies. Thanks to all who supported the Seniors Gate Collection last weekend. €317.50 Raheen/Ballinagar & €485 Killeigh. Other Winners: Sean Coffey, Bernadette Mahon, Ann Coughlan, Margaret Harte, Teresa Mulhare & Thomas Garry. 1st – 6th August. €759. Single room supplement €155-€180. Prisoners are easy to forget. Locked in institutions, they seem to disappear from society’s sight. But prisoners still belong to the society that incarcerates them. Most will eventually be released, and the experience they have in prison will greatly affect their ability to adjust to life ‘outside’ as law-abiding citizens. The Society of the St, Vincent de Paul have a panel of people that visit inmates in Midlands and Portlaoise Prison. If you wish to be involved, please text 0860462405. Tullamore BPW Meeting Wed 17th Apr 8pm in the Bridge House. "Managing Household Waste". All Welcome. Non members €5. 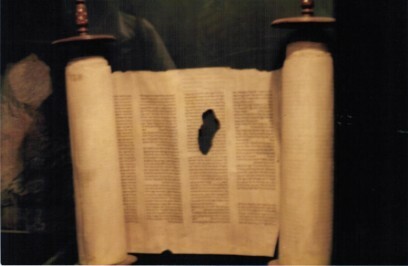 A Copy of the Scroll of the Prophet Isaiah, found in 1948 in a cave near the Dead Sea. Carbon dated showing it was writen in 70 B.C. 1st – 6th August. €759. HAVE YOU EVER CONSIDERED BEING A PRIEST? HAVE YOU EVER CONSIDERED YOUR SON or GRANDSON BEING A PRIEST? “When I reached the lowest ebb of my life, I called out to God and discovered that He was there for me””. and reporting same to the civil authorities. The LSR’s role is to promote awareness of the diocesan safeguarding children policy and procedures, and to ensure that church activities are provided in a way that ensures the safety and wellbeing of the children involved. The following can help you recognise if someone is having a stroke and ACT FAST if you see any of them. F – FACE: Ask the person to smile-does one side droop? A – ARMS: Ask the person to raise both arms and keep them there. S – SPEECH: Can the person repeat a sentence? Is their speech slurred? ….others can help you carry it. MABS – Money Advice – Hibernian Hse, 057 93 23211 / 93 52252 (free & confidential). Have you got a number in your phone after the letters I.C.E.? Grow: World Community Mental Health Movement in Ireland. but you can’t do it alone. Community Health Centre 057 9351124. Pontifical University – St Patrick’s College, Maynooth.